Can Two Cats With Upper Respiratory Disease Be in the Same Room? According to the ASPCA, cats living in a multi-cat household are most vulnerable to upper respiratory infections. Just about everyone has suffered through a runny nose and cough. 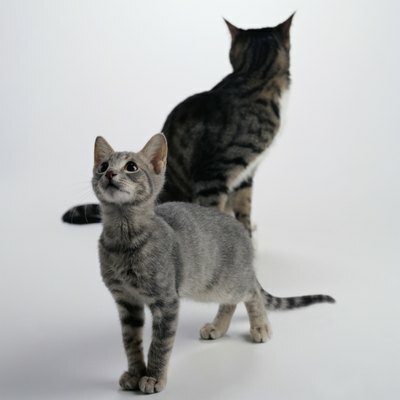 For people it's usually a common cold; for cats it's usually from upper respiratory disease. Upper respiratory infections (URIs) are common in cats. If Missy has a URI, chances are her feline housemates will catch it too. What is Upper Respiratory Disease? VCA Animal Hospital states that "feline upper respiratory infection (URI) is one term for a respiratory infection caused by one or more viral or bacterial agents." Few URIs come from bacterial agents, so if Missy has a URI she likely picked it up from a virus, such as feline calicivirus or feline herpesvirus. You'll probably recognize the symptoms of URI, as they're very similar to what we experience with a common cold. The viruses irritate Missy's nasal membranes, triggering sneezing episodes, which become more frequent and severe as her infection progresses. She may also have a runny nose, coughing, congestion, fever, loss of appetite, open mouth breathing, depression and squinting eyes. If she picks up a bacterial infection while she's sick, her nasal discharge may become thicker and yellowish. How Can Kitty Catch It? Most cats experience URIs at some point because they're highly contagious. Cats shed contagious particles in secretions from their noses or eyes, as well as in their saliva. Missy can pick up URI from direct contact with an infected cat or from exposure to a shared object, such as a shared water dish. Missy's age, general physical condition and vaccination status can all impact her susceptibility to URIs, however cats who live with other cats are most vulnerable. If Missy is under more stress, such as a change in her living circumstances, she'll be at increased risk. If she's had upper respiratory disease in the past, she can become a carrier and experience a recurrence of the condition if she's in a stressful situation. If Missy has signs of URI but her housemate doesn't, the best thing to do is to isolate Missy to decrease the chance she'll infect the other cat. If Missy and her housemate both have URI, they can be kept together during their treatment. Your vet will determine the best course of treatment. In some cases, he'll prescribe antibiotics, despite the fact that they don't work on viral infections. Antibiotics are used in viral URIs to keep secondary bacterial infections from developing, which is fairly common in URIs. Make sure she continues to eat and drink plenty of water. If Missy isn't interested in food, try using a high calorie canned food that will meet her nutritional requirements and be more tempting to her than dry food. If she's becoming dehydrated or not eating, contact your vet, as fluid therapy may be necessary. The best offense is a good defense. If Missy isn't an only cat, it's particularly important to isolate the sick cat -- or cats -- to prevent the spread of illness. Because cats shed the virus, they can deposit it in shared areas where their housemates can pick it up. Be sure to wash your hands after handling your cats, because you can act as an agent of infection too. It's also a good idea to keep Missy and her housemates indoors to decrease the risk of interacting with other cats infected with URI. Keep your kitties up to date on the vaccinations recommended by your vet; the vaccines may not prevent infection, but they can minimize the impact if your cats become infected with URI. Finally, regular vet checks and good preventive care will help keep your cats healthy; a healthy immune system will also lessen the severity of symptoms if they're exposed. Is Cat Chlamydia Contagious Between Cats? What Does the Medicine Tetracycline Treat in Cats?